This is sad but true. Google has just announced in their blog that they will end support for the Blackberry Gmail app starting 22nd November 2011. Over the past year, they have been focusing on the Gmail experience on mobile browser and they will continue to invest in this area instead of the Blackbery app. Users may continue to use the app, if installed, however it will not be supported by Google, or available for download starting November 22. 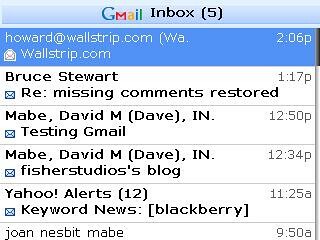 BlackBerry users can continue to access Gmail through the mobile web app at http://www.gmail.com in their BlackBerry web browser.